The City of Fort Worth Parks and Community Services Department is in the process of preparing the 2015 Parks, Recreation and Open Space Master Plan. The Plan will serve as a guide for the planning and development of the Fort Worth park system for the next five to ten years. Moreover, the Plan will provide strategic direction to ensure that the existing park system is preserved and protected and the future park system is effectively planned and efficiently developed. Most importantly, the Master Plan enables the Parks and Community Services Department to set priorities in a holistic, proactive and prudent manner to ensure the sustainability of City's present and future park system. The City of Fort Worth has experienced tremendous growth since the current 2004 Master Plan was adopted, and it is important that the 2015 Master Plan reflect the needs and interests of the city's diverse and growing population in order to serve our citizens in the coming years. You are invited to attend a city-wide public meeting on Saturday, November 1, 2014. The meeting will be held in the Lecture Hall at the Deborah Moncrief Garden Center at the Fort Worth Botanic Garden. The purpose of the meeting is to inform the public and gain input to assist in the development the 2015 Parks, Recreation and Open Space Master Plan. View the letter from Director Zavala at this link. If you cannot attend this event, please visit: http://fortworthtexas.gov/pacs/masterplans/, where you can provide input and complete a short questionnaire. For more information about the meeting or to speak to someone about the Master Plan process, please contact Joel McElhany, Capital Projects/Infrastructure Manager at (817) 392-5745. Join us tomorrow night (10/23) for ONA's fall general membership meeting! Please bring your favorite fall goodies to share with everyone at the Fall Social after the meeting! Bring the kids and your dogs to this annual extravaganza—costume contest, games, hot dogs, and a LOT of fun for the whole family!! If you want to volunteer or can drop off candy, hot dogs, buns and juice boxes, please call event coordinator Glenda Shelton at 817.975.4643 or e-mail her at glendahartsell@att.net. In the fall of 2012, I volunteered to overhaul our Oakhurst Neighborhood Association website, www.oakhurstfw.org. The old site contained valuable content, but it was built on an old platform, and it was beginning to show its age. Using Google Blogger, I created the website you see today. Blogger is entirely free and enables many rich features to make the site more interactive. And with some help from Libby Willis, I was able to migrate all of our old site's content onto the new one. The most popular search phrase is "Oakhurst Neighborhood Fort Worth". On the homepage, you will find Follow ONA on Twitter and Follow ONA by Email at the bottom left. If you connect your Twitter account or submit your email address, you’ll be notified when we publish new posts to the site. You will also notice a scrolling bar listing current events near the top of the homepage. Click anywhere on that scrolling text to jump to our Current Events page for more details. The Search bar on the left side of all pages will quickly find any keywords anywhere on the site. You can share any post on any page via Gmail, Facebook, Pinterest, and more using the small buttons found at the bottom of each post. The Visit Oakhurst page features an interactive Google Map that makes it easy for you to direct visitors to our neighborhood. Contact information for city departments, elected officials, schools, and much more is found on the City Services and Links of Interest pages. You can join ONA or renew your membership on the Join ONA page, including making any optional contributions to various committees. Transactions are handled securely through PayPal. The Contact Us page contains a web form that will directly notify me of any requests. Please feel free to submit any of your neighborhood questions or website feedback using that form, and I will forward to the appropriate officers for assistance. Thank you for visiting our website, and happy browsing! Check out this month's issue of The Oak Leaflet online! 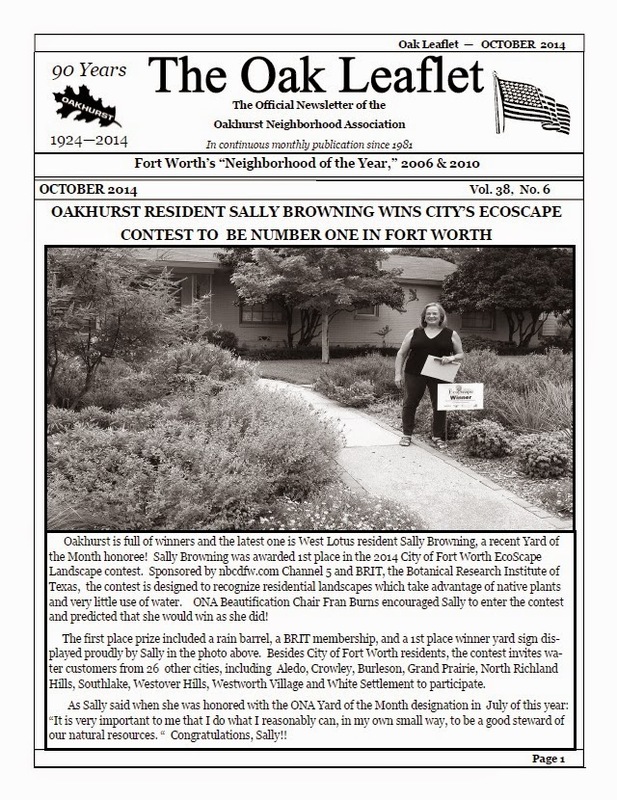 This issue includes details on our upcoming ONA Fall General Membership meeting, Police & Firefighter Appreciation Dinner, and other October events; our neighbor Sally Browning's EcoScape award; Kathryn's President's Column; and more. The City is making collection of tree and yard debris a priority after damage caused by an Oct. 2 storm. For the next three weeks, the city will not charge extra to collect large piles of tree limbs felled during the storm. Limbs should be cut to no more than eight feet long and four inches in diameter and placed at the curb for pickup on residents' normal collection days and/or bulk collection week. Residents with limbs stacked larger than 10 cubic yards (roughly the size of a Volkswagen Beetle car), are asked to notify the call center at 817.392.1234. This will allow the city to identify collection needs and assign additional equipment if needed. As always, keep tree and yard waste separate from other bulky trash so that yard trimmings can be chipped into mulch and re-used. To learn more, visit http://fortworthtexas.gov/solidwaste/yardtrimmings. 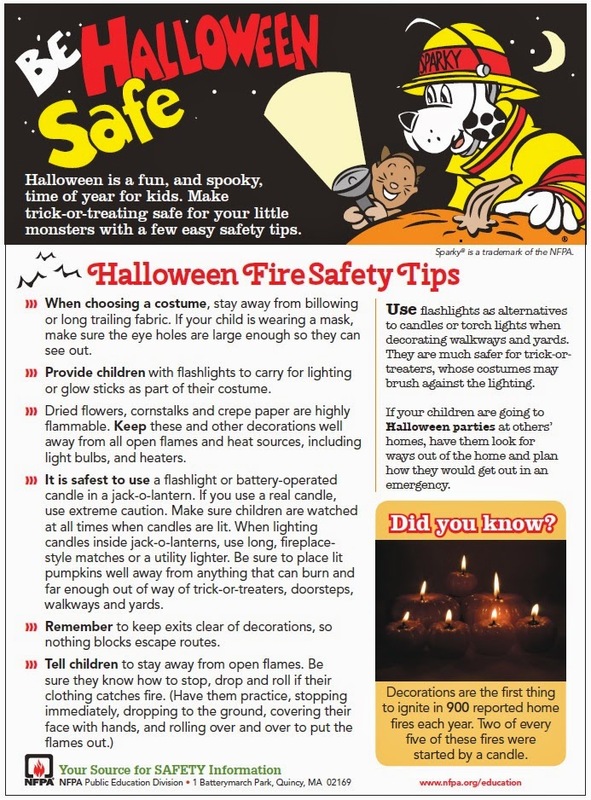 Please share with your neighbors, friends and family members. The City of Fort Worth’s Office of Emergency Management is monitoring the situation that has recently been reported concerning the first human case of ebola virus disease in Dallas County. The Tarrant County Public Health Department is taking the lead locally in this case. "We are closely monitoring the Ebola case in Dallas. There are no cases or known contacts in Tarrant County at this time," said TCPH Health Director Vinny Taneja. "We feel confident that residents in our community are safe." "Our team will continue to seek out the most updated information so we can to ensure the health and safety of everyone in Tarrant County. We intend to relay that information to the public through our website at www.tarrantcounty.com," Taneja said. "We are prepared for any changes in the situation." TCPH has compiled a bulletin of useful information on ebola. You can find more information HERE.